THE HISTORY CHEF! : Franklin Delano Roosevelt, the Election of 1944, and "Feeding Fala"
Franklin Delano Roosevelt, the Election of 1944, and "Feeding Fala"
On November 10, 1940, a cute black Scottish terrier puppy arrived at the White House as a gift for President Franklin Delano Roosevelt and his family. At first, the dog’s name was "Big Boy," but the president soon renamed him “Murray the Outlaw of Falahill” after a distant Scottish ancestor. Fala accompanied the president everywhere, eating his meals in Roosevelt's study, sleeping in a chair at the foot of his bed. Within a few weeks of his arrival, the puppy was sent to the hospital with a serious intestinal disturbance. He had discovered the White House kitchen, and everyone was feeding him. When he came home, Roosevelt issued a stern order to the entire White House staff: "Not even one crumb will be fed to Fala except by the President." From then on, Fala was in perfect health. While being pampered at the White House and traveling with Roosevelt, Fala had the good fortune to meet many famous political leaders, including British Prime Minister Winston Churchill and Mexican President Manuel Camacho. Thrust as he was into the national spotlight, it’s perhaps not surprising that Fala became embroiled in a political controversy during the presidential campaign of 1944. You see, earlier that year, Fala had faithfully accompanied his master on a diplomatic trip to the Aleutian Islands. Shortly after the president returned home, a rumor began circulating that Fala was accidentally left on one of the islands and that the Navy had to send a destroyer back to retrieve him. These Republican leaders have not been content with attacks on me, or my wife, or on my sons. No, not content with that, they now include my little dog, Fala. Well, of course, I don't resent attacks, and my family doesn't resent attacks — but Fala does resent them. You know, Fala is Scotch, and being a Scottie, as soon as he learned that the Republican fiction writers in Congress and out had concocted a story that I'd left him behind on an Aleutian island and had sent a destroyer back to find him — at a cost to the taxpayers of two or three, or eight or 20 million dollars — his Scotch soul was furious. He has not been the same dog since. I am accustomed to hearing malicious falsehoods about myself — such as that old, worm-eaten chestnut that I have represented myself as indispensable. But I think I have a right to resent, to object, to libelous statements about my dog. his legs straightened out, his ears pricked up and I knew that he expected to see his master coming down the drive as he had come so many times. Later, when we were living in the cottage, Fala always lay near the dining-room door where he could watch both entrances just as he did when his master was there...Fala accepted me after my husband's death, but I was just someone to put up with until the master should return. FAST FACT: Fred D. Fair was Roosevelt’s porter on the Ferdinand Magellan, the presidential Pullman rail car. 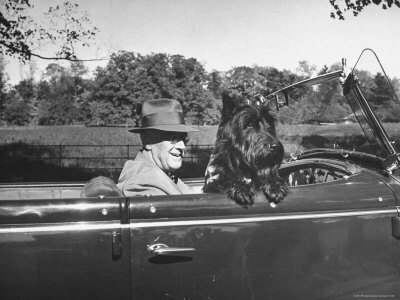 In a Washington Post article, Mr. Fair recalled his memories of the president's beloved dog in a letter titled "Feeding Fala": I served him his meals, made his bed. We would serve the president highballs before dinner. Before the meal, I would fix Fala's food. He would never go into the dining room until you called him. We'd serve him in there. But you couldn't serve Fala yourself, oh no. You had to hand it to the president, and he'd feed Fala out of his hand. Many times, I remember dignitaries and other important folks waiting for their supper until Mr. Roosevelt finished feeding Fala."